FAITH, FAMILY, FREEDOM. GET TO KNOW THE COALITION BEHIND TEXAS HIPPIE COALITION. WAY BEYOND FANS, MEET SOME OF THE MANY FACES OF THE COALITION. You might be hard pressed to hear a Texas Hippie Coalition song played on the radio, however Texas Hippie Coalition has recently signed with a major label, and are currently in the studio to release a new album. The success of Texas Hippie Coalition is self-driven, and it’s not from flashy marketing, or advertising that the band has seen the most success. People come out in droves because of the music and the sense of community created, by basking in the environment that, vocalist, self-proclaimed King of Texas, and all around leader; Big Dad Ritch so masterfully cultivates. 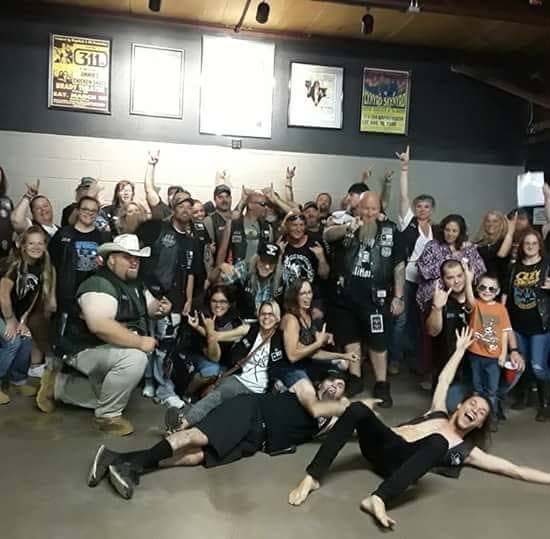 Texas Hippie Coalition sells out venues, plays on major festivals, and has fan club chapters worldwide, however this success has little to do with major media outlets or radio promoting them. This success, has to do with the Coalition of fans that Big Dad Ritch has generated, by just being himself. The Coalition is more than a fan club, the Coalition is a family. Go to any Texas Hippie Coalition show and it will not take you long to see that this is not like every other Rock show. What drives fans to a band? What makes one group of musicians drive that kind of following when mainstream media has almost left them slip under the radar? If you take a quick scroll over articles on Google, there are hundreds of marketing examples on how to grow your fan base for budding musicians, and there are articles about fan clubs, and what makes them successful, and there are articles about the psychology of Heavy Metal music and how its followers are more susceptible to join together. Some of these elements might be true, but you have to be there; in the music halls, and venues, and after the show in local dives for a dinner get together, and gathered in people’s backyards, before a show. You need to be sitting with fifty other people in someone’s living room, which is maybe only 330 square feet, and built to hold eight or ten people at a time, at most. Never the less, that room will be standing room only, and the walls will be ready to burst; because everyone wants to be together in that room; in that moment; that is how the Coalition gets together It’s in the laughter, it’s in the sharing of good food, a drink, or a smoke; and it’s in the sharing of the music that we all love, that brings together the Coalition. All kinds of bands have fan clubs, but what makes Coalition family travel hundreds of miles, drive for days straight, fly in airplanes; and bring everyone from their children to their grandmothers; to be at a one night show? Its part belonging, its part losing yourself, and your troubles in the music, and finding comradery and sense of community; knowing you have a family in almost any state you travel. For some the Coalition is finding the family they never had anywhere else. Sure, plenty of bands have massive and active fan bases, but with Texas Hippie Coalition the experience is truly authentic, and like no other. Big Dad Ritch, just as the name implies is larger than life, and a father figure to many. Picture a dysfunctional family reunion, only triple the size, with some of the best Rock N’ Roll music, and the best BBQ, and “Hippie Root Beer” you can imagine, and you might get close. However, you have to more than picture it, you have to be there. With the recent signing with a major label, Texas Hippie Coalition can only grow and spread this sense of community even farther. It makes you wonder if someday someone will be writing about the Coalition in the same way writers have reminisced about The Grateful Dead, and The Deadheads. Like Jerry Garcia, Big Dad Ritch is unanimously loved by the bands followers, and to some even idolized. Big Dad Ritch has a sense of bringing everyone together. People literally come for miles, bring tents or RVs and camp out where they can; some barely miss a show all year. Despite all the partying, good times, and elements that go along with a Rock show, Big Dad Rich ends every meet and greet, and begins most shows, with a prayer circle with Coalition members, and fans. I remember the first time I met Ritch at a show, a few days after leaving the hospital for a severe burn injury. Ritch greeted me with a hug, he had heard my story, and confirmed that he would have people praying for me all the way down in Denison, Texas. For a lifelong Rock and Metal fan, I have met and had great experiences with many performers, but for Ritch to make that gesture left a lifelong impression on me, which has made me forever vested in the Coalition. The friends and family that I have met in probably one of the darkest times in my life, is part of the reason why I went through that time with as much strength as I had. Aside from my own family, to have met and connected with so many people on such a personal level, as if to have a second family, is something words cannot describe. The entire time during my recovery there was no shortage of phone calls, texts, messages, and prayers each day. This comradery and sense of caring is unanimous throughout the Coalition. The Coalition boasts its own charity group, which members raise funds to help other members in need, all on their own. The Coalition creates stickers, art, jewelry, has auctions and rallies together when someone has suffered an injury, lost a job, or needs help along the way. The Coalition does all this because I believe good people attract other good people; and Big Dad Ritch is as genuine as they come. As the Coalition has grown Ritch has made an example for the Coalition, with its own set of bylaws on how to treat one another. The Coalition began in 2005 when the band was just getting its start. Loyal friends and long term supporters Arthur Martin, known as The Lord of The Hippies, and Dennis Fogarty, were the first to be deemed Coalition family. At this time Big Dad Ritch bestowed the first “Bully” Patches as gifts for reward of loyalty. As the fan base grew from Denison Texas, beyond into Dallas, and further into Oklahoma, Ritch elected to reward other family members in the same way, which formed the core family group. Ritch’s way of treating people, coupled with his own style of Southern friend, and perhaps Country fringed, Heavy Metal, known as Red Dirt Metal; and the experience the band created at every show grew his base of loyal followers. From the prompting of then label, Carved Records, Big Dad Ritch extended his arms, to welcome in more fans to his “dysfunctional” family. Texas Hippie Coalition then offered what they labeled as High and Mighty patches, or fan club patches to any fan who wanted to purchase one. These patches now identify the Coalition, marked with a Long Horn Bull head on the back of the cut or jacket, the bands logo, and various Texas patches on the front. It is impossible to miss die hard Coalition members at any show. Though fans could now purchase The High and Mighty patch set and declare their allegiance to the band, and other Coalition members, Ritch then continued to elect members each year as “Family”, bestowing an additional “Family” patch to those he recognized as having qualities he appreciated, or those who were voted in by other family or Coalition members. Texas Hippie coalition would hold a special family reunion, and patch in ceremony each year on April 20th. Often family members will welcome in new fans, and take them under their wing, within the group. I love them, straight up I love my fans, I tell them every night from the stage, you know I have one of the biggest egos you’ve ever seen, but I’m not egotistical and I know every time I take the stage that those people in front of me deserve a show. No matter how sick I may be, or it’s my ninth show in a row, and I’ve traveled a thousand miles and I’m tired, and it don’t make a damn, those people paid money to see me and I need to give them as good of a show as I did nine days ago, when I was doing my first show, and I need to deliver and I need those people to know that I do care. You know, I do care, and I mean there’s a lot of rock bands out there that right now they are on stage, and have got big singles and are killing it, and they don’t love their fans, and you won’t know them or see them in five to ten years, you won’t know who they are or who they were, but right now they are on top of the high horse, and that’s cool but if they don’t reach down and try to become equal to their fans ; I tell my fans every night I am just like you, I just have a different paying job. You know, just like you guys I’m not paying my rent in December because I’m buying Christmas gifts you know, and you know I’m just like everybody else I am just a normal old guy, I fish, I hunt, and keep my family close to me, keep it big, and I let everyone know every night how much I appreciate them from the stage, and I let them know that I thank them all so very much for putting food on my table, and a roof over my head; and that’s every single night I let them know how important they are to me. I take pictures of them, I have a family album here at my house, then I have an extended family album, and my extended family album is about 80 inches tall. I take pictures every night in front of the stage, in front of the fans, you know I just make sure that I remember everybody, and when we come off stage, you know, we have VIP meet and greets, you know but we are not just going to cater to those people, those people get to come back and join us for prayer and chit chat and talk, but when I come off stage I still go and I meet all the fans and shake hands, hug everybody, sign whatever they want me to sign, and just try to be as close to them as I can and that’s what is important is that you know, we don’t treat them like fans, we treat them like family, and that’s why they are still with us a decade later. If you ask any Coalition member, or family member they will tell you the same thing, they come for the music, and they stay because they end up becoming family. Upon speaking with Arthur Martin, he reflected that in some ways the Coalition has become larger than the band, however he noted, “Without those bad asses, there would be no Coalition.” Go to thcofficial.com, get your patches, come to shows, the experience you find here is guaranteed to change your perspective from any other Rock show you have been to. Big Dad Ritch has the ability to draw in, and continue to create for himself the best family you will ever have the chance to meet. He writes the soundtrack to that family every night on stage, and the people just keep coming, and they will keep coming. For as long as there stands a long haired outlaw with a heart just as big, Hell bent on doing things his way, with no sense of changing; and a band of Hippies known as Texas Hippie Coalition, there will always be a Coalition to follow. Special Thanks to Big Dad Ritch, and Arthur Martin, "Lord of the Hippies"
The love of Family – Bernard Dalton Jr.